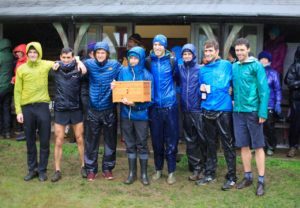 The Hodgson Brothers Mountain Relay was originally established in memory of Ian Hodgson, who was tragically killed in a cycling accident the day after he had won a mountain marathon in Patterdale. It was renamed in 2015 in honour of Ian’s brother Michael who was instrumental in establishing the event as a four-legged paired relay and promoting it to what has now become the premier event in the fell running calendar. The undisputed kings of the event are Borrowdale Fellrunners who won a record 19 times in a row before their defeat last year at the hands of Dark Peak. Despite this, Keswick had been close challengers for the past couple of years. buoyed by their recent British and English Championship victories they lived up to their status as pre-race favourites to take home a famous victory. Unfortunately, an inclement weather forecast forced the traditional route to be shortened to an out-and-back race from Patterdale to Kirkstone pass and back. A wise decision by the organisers, who executed a challenging event to perfection. Leg 1 was the only unchanged leg; from Patterdale to Hartsop via Angle Tarn. Slattery and Craig Smith protected the team’s position on the last leg with its steep climb and long, fast descent to Patterdale. Despite closing on local rivals Ellenborough AC they were unable to improve on 17th overall and 3rd Vets team but this was the best result for the Vets in recent years and all were justifiably proud of a podium finish. Ambleside Vets took the win in 2hrs 58mins after an impressive run which saw them ahead of their Open team for parts of the race. Helm Hill took second in 3hrs 3mins with Keswick 3rd in 3hrs 8mins. The ladies race was also full of drama, with the first three teams, Ambleside, Helm Hill and Dark Peak changing positions on nearly every leg. Keswick Ladies were right up there, with a strong Leg 1 performance by Trudy Beetham and Lindsay Walker but were forced out of the mix by a navigational error on Leg 2. Catherine Spurden and Jenn Mattinson were travelling extremely well all the way up the tough ascents, but first time round Jenn failed to find the tarn on Caudale Moor and lost about 12 minutes for the team. Not giving up, Cat Evans and Hannah Horsburgh ran their socks off and achieved the fastest ladies Leg 3 of the day, a superb performance. This was followed by a strong Leg 4 run by Jo Gillyon and Rachel Mellor, so the ladies finished a very creditable 4th position.